Thomas Young (1773-1829) — physicist, physiologist, physician and polyglot, among several other things — became hooked on the scripts and languages of ancient Egypt in 1814, the year he began to decipher the Rosetta Stone. He continued to study the hieroglyphic and demotic scripts with variable intensity for the rest of his life, literally until his dying day. From 1814 until the publication of his important Encyclopaedia Britannica article (‘Egypt’ in 1819), Young had had the field of hieroglyphic decipherment largely to himself. Champollion, though actively interested in the Rosetta Stone from 1808, did not tackle its decipherment in earnest until 1821. He quickly overtook Young and became the founder of Egyptology as a science. 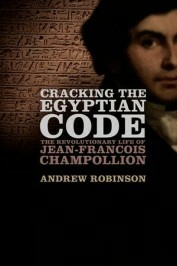 Cracking the Egyptian Code: The Revolutionary Life of Jean-Francois Champollion by Andrew Robinson is the first biography of Champollion in English, this book shows how he cracked the code of hieroglyphics. It brings to life the rivalry between Champollion and the English scientist Thomas Young, who claimed credit for launching the decipherment.